With so many health and weight loss benefits, dark chocolate is a nutritional powerhouse. When eaten in moderation, this superfood can significantly improve your health. Dark chocolate is plentiful in powerful antioxidants, including flavonoids. Milk chocolate may seem to be tastier, but it’s not as healthy as dark chocolate and it contains less antioxidants. Moreover, it contains unhealthy fats and added sugar. Many people believe that dark chocolate is bad for heart, but it turns out that small amounts of dark chocolate can actually be good for it. According to a study published in Molecular Nutrition Food Research, eating a piece of dark chocolate that contains no less than 70% cocoa a day can help to lower your risk of heart disease as well as stroke. As I mentioned above, dark chocolate is rich in antioxidants that help boost your brain power and prevent memory loss. However, it doesn’t mean that you should eat it all day long. A few pieces of dark chocolate a day will be enough to keep to improve your brain functions. Snacking on raw nuts (especially walnuts) and a piece of chocolate will give you an instant energy boost. 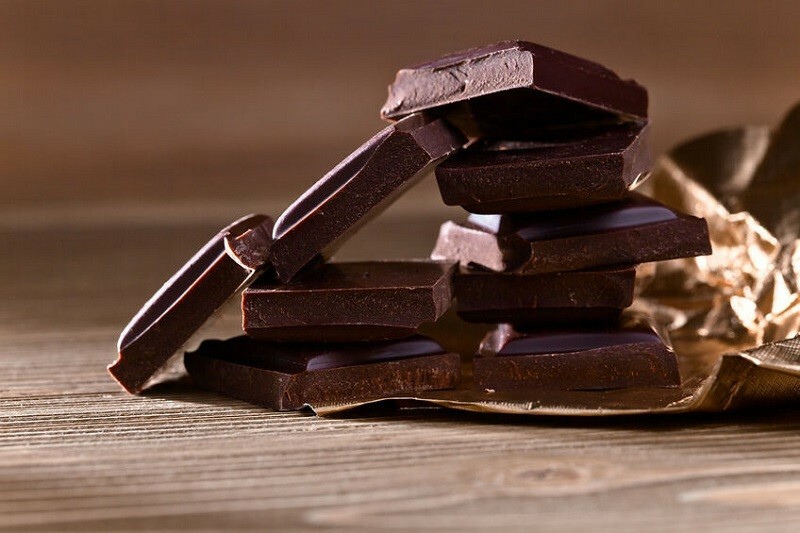 While dark chocolate is not a cholesterol cure, incorporating a piece of it into your daily diet can help to increase your good cholesterol level. It’s all thanks to a high content of flavonols that have anti-inflammatory and antioxidant properties. Opt for dark chocolate with the highest cocoa content. If you suffer from chronic hypertension, eating dark chocolate may not help you; you need to see your doctor first. However, eating a little chocolate that contains no less than 70% cocoa a few days a week (or at least once a week) helps to keep high blood pressure at bay. Studies show that eating dark chocolate can help to combat free radicals that cause premature aging and a number of diseases, including heart disease, Alzheimer’s disease, and cancer. It also helps to keep your cells healthy. Again, don’t overdo it. Eating too much chocolate can lead to some serious diseases as well. Dark chocolate is a good source of magnesium that helps to fight fatigue, reduce your stress levels, and can even prevent depression. Next time you feel tired and stressed, opt for a piece of dark chocolate, chocolate milk or any chocolate dessert to banish tiredness, fight stress and boost your mood. Probably you already know that there are certain foods that we should eat for perfect skin. Dark chocolate is one of them. When you eat chocolate in moderation, it doesn’t cause acne. Antioxidant-rich chocolate helps to prevent wrinkles, protect your skin and make it smoother and healthier. However, excessive consumption of dark chocolate may cause breakouts. When you include dark chocolate in your eating plan, don’t forget about moderation. Dark chocolate still contains sugar and fat and eating too much of it will do more harm than good. I don’t eat dark chocolate daily – I eat a piece of chocolate three times a week – but I feel its great health benefits. Are you a big lover of dark chocolate? Do you think it’s healthier than milk chocolate? What’s your favorite way to add this superfood to your diet?